By becoming a Member, you are helping us to provide the very best care for all of the cats that call In-Sync Exotics home. The proceeds from the membership program fund nutritionally species specific diets, vitamins and minerals, excellent veterinary care, and enrichment toys. 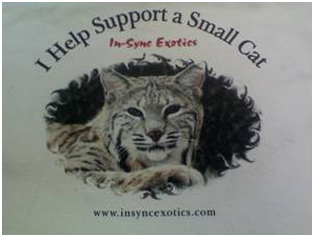 On behalf of the cats, thank you for deciding to join our family by becoming an In-Sync Exotics’ Member! In-Sync Exotics Membership card, which gives 10% off of any purchase in the gift shop. Monthly e-mail, Inside In-Sync, summarizing events at the sanctuary, medical updates, how the cats are doing, etc. This will give a much more detailed glimpse into life at In-Sync Exotics, that isn’t available anywhere else! One exclusive photo e-mailed to you per month that isn’t posted anywhere else.